Obama warned Republicans against playing a "dangerous game" with the economy in the newest battle over the national debt ceiling. President Barack Obama warned Congressional Republicans on Saturday against playing a "dangerous game" with the economy as lawmakers prepared for a new battle over the national debt ceiling. But the Democratic president also congratulated lawmakers for passing an 11th-hour deal that avoided the so-called fiscal cliff. Signed into law Thursday, the compromise raised taxes on the wealthiest Americans while avoiding a tax hike on the middle class that "could have thrown our economy back into recession," Obama said in his weekly radio address, AFP reported. But new battles are brewing after the deal delayed by two months a debate over raising the country's $16.4 trillion borrowing limit and more than $100 billion in automatic spending cuts for military and domestic programs. If Congress fails to clinch a deal to allow more government borrowing, it risks causing the government to default on its bills and financial obligations. Republicans, who accepted the fiscal cliff deal without any significant spending cuts, are now demanding concessions on expenditures in return for allowing the ceiling to rise. Yet Obama vowed that he "will not compromise" on insisting that Congress raise the federal debt ceiling. The US credit rating was downgraded in 2011 when lawmakers threatened to leave the debt ceiling as it stood. "If Congress refuses to give the United States the ability to pay its bills on time, the consequences for the entire global economy could be catastrophic," he said. "Our families and our businesses cannot afford that dangerous game again." House Speaker John Boehner has warned Republicans will ask for "significant spending cuts" and reforms of expensive programs that provide pensions and health care services for the elderly. 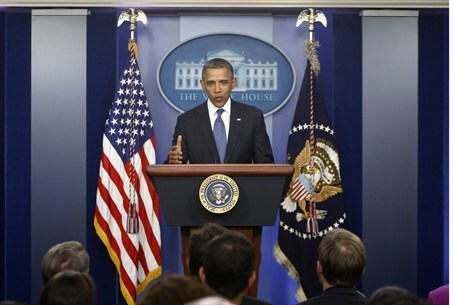 Obama said he backs spending cuts, but insists he will not shortchange education, job training, research and technology. "Spending cuts must be balanced with more reforms to our tax code," he said. "The wealthiest individuals and the biggest corporations shouldn't be able to take advantage of loopholes and deductions that aren't available to most Americans." In the Republican address, House Ways and Means Committee Chairman Dave Camp of Michigan said that in addressing the debt limit, lawmakers "must identify responsible ways to tackle Washington's wasteful spending." And he said American families know that "when you have no more money in your account and your credit cards are maxed out, then the spending must stop." China is the largest foreign holder of US debt, owning about $1.2 trillion in US treasury bills, notes and bonds, according to the Treasury Department. In total, China owns about eight percent of publicly held US debt. Camp accused the president and Democratic lawmakers of refusing to take "any meaningful steps to make Washington live within its means" and urged them to reconsider their position and join the fight on "wasteful spending."